Every year we help thousands of organisations around the world with their Branded USB Flash Drive needs. It’s always great to see our Flash Drive models being put to good use, so we just had to share this latest story. Marguerita McGovern got in touch with us recently. Marguerita is the Practice Learning Coordinator for the Masters in Social Work Programme at the National University of Ireland, Galway. Marguerita is writing an interactive series of electronic books for social work students, practice teachers and tutors. Her work is titled 'Social Work Placement: New Approaches. New Thinking'. Marguerita chose our Wafer model to brand and preload with her work. The Wafer was also presented in our Presentation Tin. The highlight for us and Marguerita was when the President of Ireland, Michael D. Higgins, visited the University to learn more about the Department and their work. 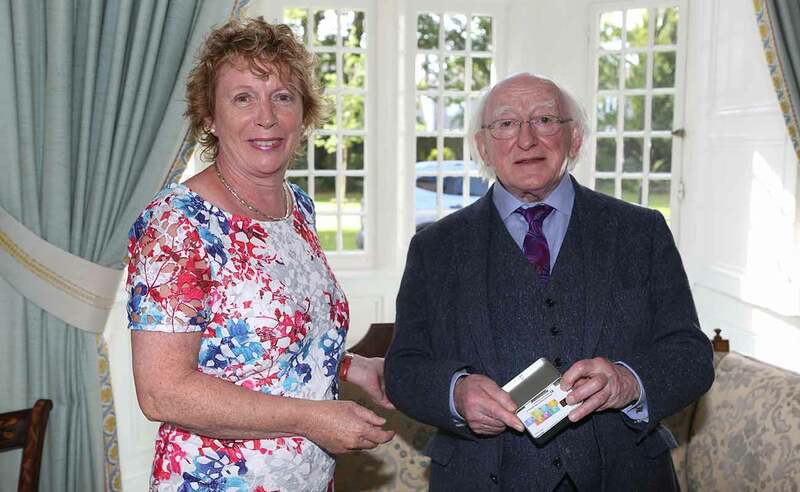 Marguerita presented President Higgins with her work, showcased beautifully on our Wafer USB Card and Presentation Tin. The Wafer was a great choice of model to showcase Marguerita’s branding. The added extras of our Data Preloading Service and Presentation Tin allowed Marguerita to promote her work in a stylish and convenient fashion. If you’d like a Quote on your next order of branded USB Flash Drives, simply fill out our Quick Quote Form here. A dedicated Account Manager will then be in touch as soon as possible.